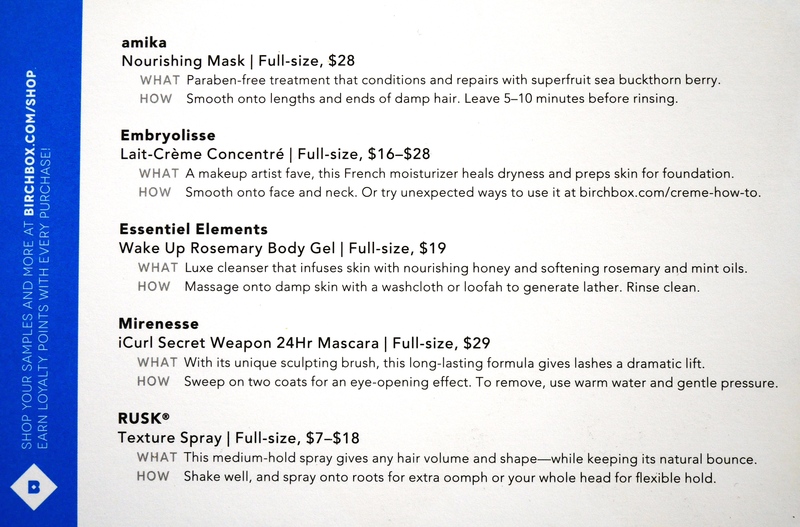 Amika Nourishing Mask – yet to try, however I’m completely over receiving hair products in my box. Embryolisse Lait – Creme Concentre – Hmmm this is a tricky one, I’m aware its received a cult status among UK beauty bloggers. However one ingredient of this product may not suit my sensitive acne prone skin which is Paraffinum Liquidium. I might patch test on my jaw and then work my way to the rest of my face. Obvs very apprehensive about this one! Essentiel Elements Wake up Rosemary Body Gel– So here how it goes, smells good. 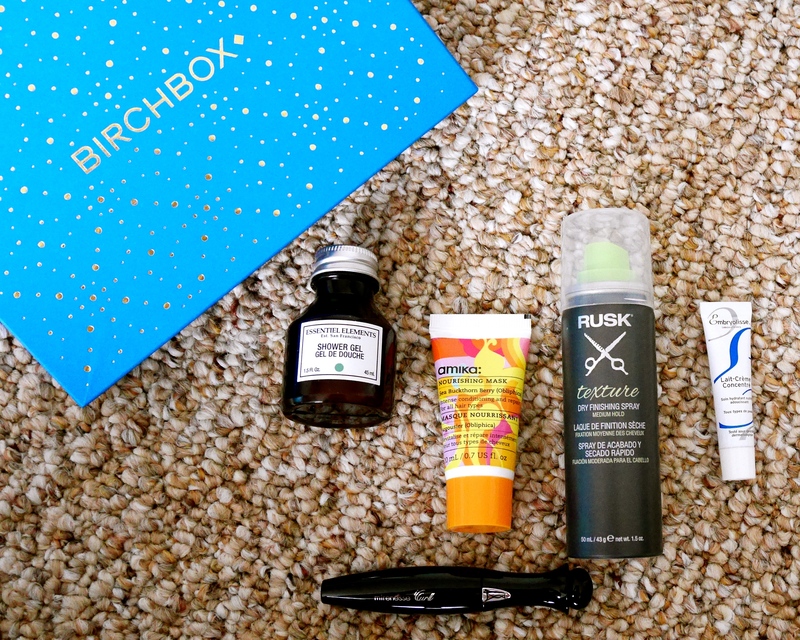 But seriously Birchbox, this a complete cop out. Body Wash!!! I was hoping for something more special for Christmas. Yes more special than a darn body wash! Mirenesse iCurl Secret Weapon – One can have never have enough mascaras, as simple as that. This was a sample choice and I’m yet to try. If it doesn’t work for my upper lashes, with the brush being so small I can use on my lower lashes, win win. Rusk Texture Spray – Put simply, Bloody Fab! I’m buying the full size product. It has given my fine, limp hair new life. It feels thicker, more manageable and gosh the Volume. Defo Buy. Overall, the box left me very very underwhelmed this month with slow delivery, hair mask and body wash. The texture spray and the box itself (bright blue with golden polka dots) were a saving grace. Did you like or love your box this month? Let me know in comments below. I was so disappointed when I checked the ingredients of the embryolisse because it’s so hyped up, yet it’s a very bad quality product. Btw. I am giving away an Urban Decay Naked On The Run palette, so if you’re interested, go ahead and check out my giveaway post! Hope you have a good day!